We love the illustrations in this one. The rhino has lots of cheeky little expressions and Ivy finds the pictures of impending disaster really funny. 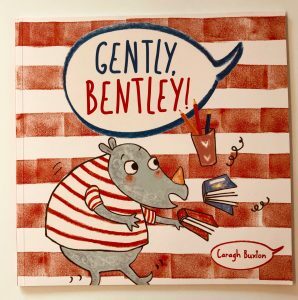 She yells ‘Gently Bentley’ on every page – and ‘Gently Ivy’ is now a very familiar refrain in our house! It’s perfect for helping rowdy little ones learn that rushing around without minding others can have consequences. I’d also recommend it for small children who are soon to become a big brother or a big sister as it shows how you need to be gentle and loving around babies.